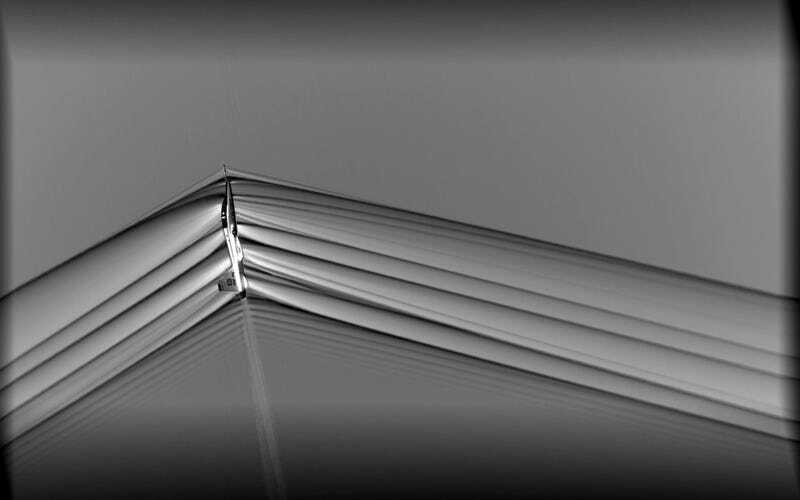 An air-to-air imaging technology developed by NASA has resulted in the first images ever taken of interacting shockwaves produced by in-flight supersonic jets. 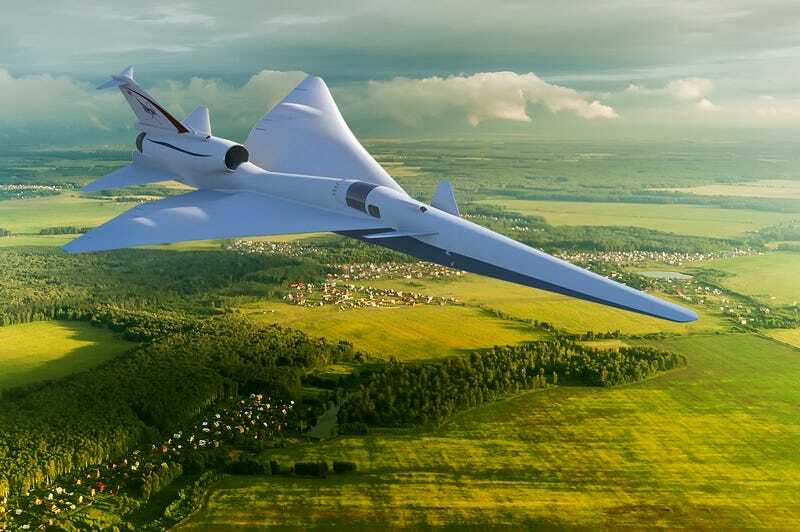 The new images, in addition to being beautiful, will help NASA design jets capable of producing gentle rumbles instead of loud sonic booms when breaking the sound barrier. The project, called AirBOS, or Air-to-Air Background Oriented Schlieren flights, recently took place at NASA’s Armstrong Flight Research Center in Edwards, California, reports NASA in a press release. A new imaging system used during the test is now the first to capture high-quality images of interacting shockwaves produced by two different aircraft. Like any plane, jets produce sound waves when the travel through the air. When the plane travels slower than the speed of sound—typically at around 700 miles per hour—the soundwaves spread outwards ahead of the rushing aircraft. But when a jet goes supersonic, the aircraft starts to move faster than the soundwaves ahead of the plane. A sonic boom results, as the jet flies past the propagating soundwaves. The loud boom is essentially the combined sound of the waves that would’ve normally spread out in front of the aircraft. Special imaging equipment can be used to visualise these waves, which are detected as rapid changes in air pressure. In this case, the images show two T-38 jets flying in formation about 30 feet (10 meters) away from each other, with the trailing jet some 10 feet below the one in front. An airborne NASA B-200 King Air captured the images while flying above. 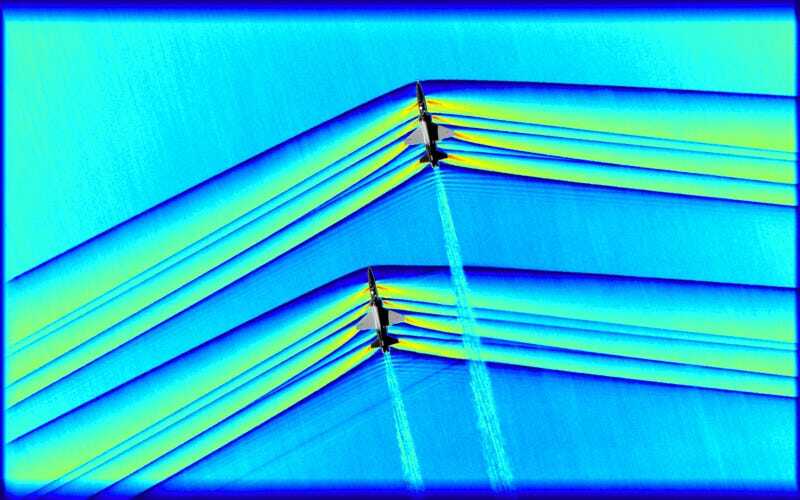 The images of the intersecting supersonic flows are a first for science, according to NASA. To capture the images, the King Air flew in a pattern some 30,000 feet above the ground. Once at the target position, the aircraft was able to document the pair of T-38s passing quickly below—about 2,000 feet below the B-200 King Air. Its special cameras could only record for three seconds, so the timing had to be perfect. Data collected during the AirBOS experiment will help NASA engineers to develop the X-59 Quiet SuperSonic Technology X-plane, or simply X-59 QueSST. This plane will be capable of reaching supersonic speeds, but instead of producing a sonic boom, it’ll make a rumbling sound once it exceeds the speed of sound. A supersonic aircraft with this capability could be given approval to fly over land, which currently requires clearance in the United States. In addition to acquiring these images for research, the goal of the NASA exercise was to perform in-flight tests of the new imaging equipment. NASA has studied shockwaves using the schlieren photography technique before, but the new system was upgraded to capture three times the amount of data during the same amount of time, and its frame rate was increased to 1,400 frames per second, among other modifications.